Do you ever wonder where that far-off world has gone? A Shropshire museum has become the final resting place for some of our treasured household items from times gone by. A Shropshire museum has become the final resting place for some of our treasured household items from times gone by. Chris Upton visits the Land of Lost Content. THE county of Shropshire contains many a quaint and curious town, full of history and half-timbering. Its rolling hills seem to invite such quiet and tranquil settlements, from black-and-white Cleobury to sedate and elegant Ludlow. Craven Arms could hardly be included in this category. It’s not particular old, and it’s not especially picturesque either. Named after a hotel on the main road, Craven Arms is a creation of the Victorian railways, which in turn fostered small industries and a market. Nevertheless, Craven Arms boasts one remarkable attraction. To be fair, it can claim two others in the shape of a museum of the Shropshire Hills and Stokesay Castle, the striking fortified manor house on its outskirts. But let’s leave these for another day and concentrate instead on the former market hall, in Market Street, just off the A49. Welcome to the Land of Lost Content. A.E. Housman is a familiar figure in these parts, his last resting place being in the graveyard of St Laurence, Ludlow. That oft-quoted poem, with its blue remembered hills and yearning sense of loss, is perhaps his best-loved work. But the museum that takes its name from Housman is more than this, and certainly no simple tribute to the Shropshire Lad. Change the stress on the word “content” and you have a more accurate introduction to what lies within the old market hall. For the Land of Lost Content is where all our childhood toys disappeared to, the last retreat for our kitchen gadgets, the home for all the tins and packets that once lined our cupboards. Here are the contents of all our living rooms and kitchens, from the First World War to the 1980s. Not lost at all. The Land of Lost Content is the brainchild of Stella and Dave Mitchell. Stella was an art student at Birmingham Polytechnic in the 1970s. For her final degree show she assembled a collection of ephemera, much of it bought for pennies in the old Rag Market. At that point Stella was hooked. What began as a cutting-edge art installation has metamorphosed into something we can all buy into. 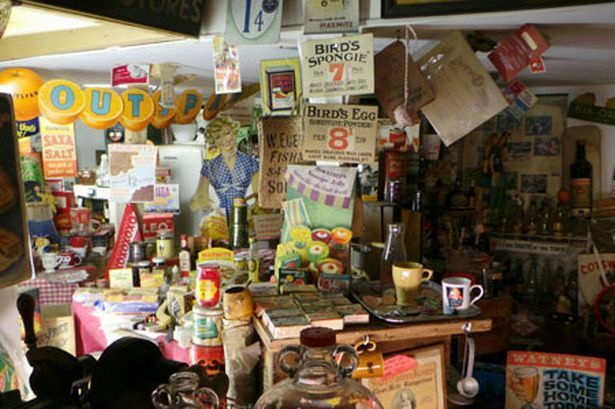 As the collection began to grow Stella and her husband moved it to the South coast, and set up a museum called Rejectamenta at East Wittering in West Sussex. That was in 1991. Twelve years later the couple returned, as they had always planned to do, to the West Midlands, and in 2003 opened a new museum in a disused Victorian building at Craven Arms. The destination could hardly be more appropriate. I’ve made three visits to the place since then, and fondly tell my students about it too. In a world where so many of our museums have gone hi-tech, and are packed with interactives and touch-screens, Lost Content is a reminder that at the heart of any good museum are objects, and preferably a lot of them. Indeed, there could hardly be more objects, three floors of them, to be precise. On our most recent visit, Stella had just returned from the weekly flea-market at Abergavenny, with yet more treasures to squeeze in somewhere. What the world throws away, Stella picks up. I still miss the Opie museum of packaging, which once occupied part of Gloucester Docks, but the Land of Lost Content makes for a worthy replacement. And all of it has been achieved without a single grant from the HLF or any other funding body. It’s all the Mitchells’ own work, and I suspect every entrance fee gets recycled into more and more objects. Some day soon, you won’t be able to get into the place at all. I defy anyone to get in and out of here in less than three hours. More likely they will be politely ushered out when the museum closes at 5pm. This is not simply a museum of social history – an object lesson in how we lived then – it is also a journey into personal memory. There are the board games we played as children, the decorations we put up at Christmas, the utility furniture we once bought, the food we ate, the little plastic toys we found in packets of cornflakes. Spangles, powdered milk, love-hearts, Andrew’s liver salts, Fairy Snow, powdered egg, Escalado, games compendia, I-Spy books, Franklyn’s Fine Shagg (it’s a tobacco, by the way). If you wondered where that far-off world has gone, it’s in Craven Arms. Every time I go to Stella’s kingdom of bygones, I find something new. Last week I picked up an old recipe card, forged in days of austerity. Macaroni cheese, it said, is cheap and filling. There was a set of recipes to prove it, for plain macaroni cheese, one for macaroni cheese and crab, another for macaroni cheese and ham, and yet one more for macaroni cheese and mushroom. And just to round off the family’s gourmet week, there was yet another variation on the theme, this time for macaroni cheese surprise. Not a surprise at all, I fear. If you’ve never been to the Land of Lost Content, then let me direct you thither. Head for the Blue Remembered Hills and turn left.